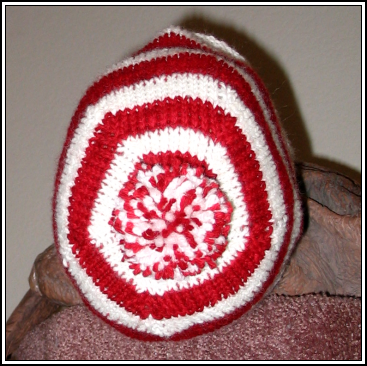 KnittyOtter: Amazon Christmas and A Red & White Hat! 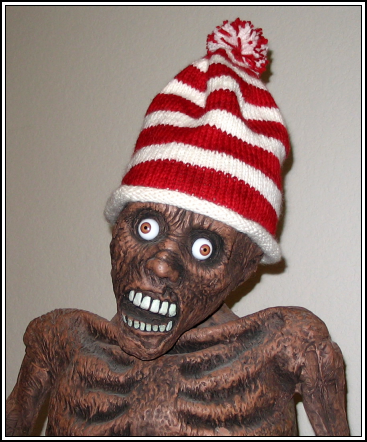 Amazon Christmas and A Red & White Hat! 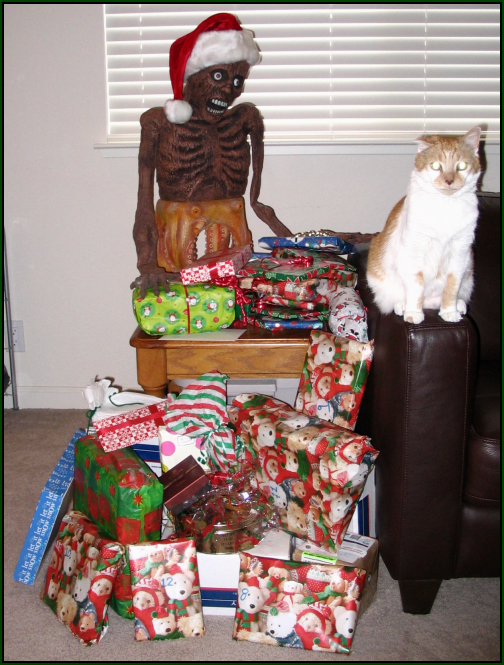 The presents wrapped in festive snowman wrap were waiting to be mailed to friends and family… who would proclaim upon opening, “Oh Lookie, More Crap!”. 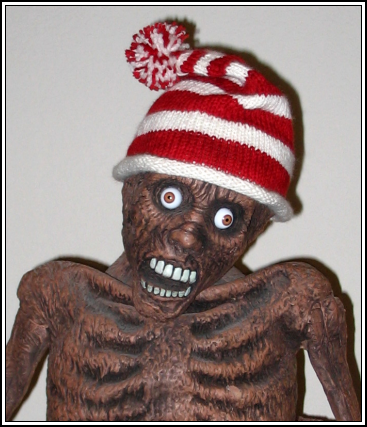 So Merry Wintertime Holiday Shopping Season to All and to All a Zombie Fun Night! Here's George looking fairly normal in the hat. It's just a simple roll bring hat. Just made a big stockinette tube, in stripes and decreased when I thought it was long enough. I need to get some white fleece to line it with. I'm going to use this Dulaan Hat as my George Holiday Topper this year. I have a lot of wrapping to finish up this week. Plus packing and mailing... and the a different kind of packing. I'm not really sure when I'll have time to decorate George actually. I want to do some serious dusting first. I'm pretty much done with my Holiday shopping. Got a few things on their way in the mail. It's good to be done early. Even if it feels late. My big holiday get together is in just a few weeks so I'm pushing it close on that. o.0 Where'd the time go. Geaorge is always the center of attention. And TKK, too. George needs a little green. Maybe a holly necklace? Or a GREEN SCARF!! YES! I agree, George needs a necklace. Perhaps a light-up bulb necklace? He could work the Christmas colors. And brava for the poem! No apologies to Clement Moore - yours is outstanding! The way I view Amazon is one item for them, one for me...isn't that how it is supposed to work? Shopping? I should be doing some sort of shopping this time of the year. I don't think I received that memo. I think my mouse ate it. Does George have tentacles for legs? It looks like it in one of the pictures. That is too funny. Wonderful hat.